Nagano is host to the 1998 Olympic bobsleigh run which doubles up for skeleton and luge as well. 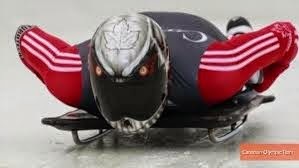 Skeleton, where you are facedown and head first, is actually considered the safest of the three disciplines. If you fall off a skeleton sled you’re only a few inches from the ice and the two of you will travel as a pair together to the end. Fall off a luge and you may become airborne and that can get unpleasant. This is where it gets awesome. Twice a year, the track is opened for public days. The first run, to let you get used to the idea, is one third from the bottom. They push you off and a team is waiting to catch you at the finish line. Then it’s one third from the top and you really feel the speed, and a little like Darth Vader as you breath in and out and all you can hear is the ice and your breathing. The finish line is a long straight incline and almost everyone finishes at around the same point where the team is waiting for you. However, as a foreigner, I had a little bit more gravity on may side and went through the finishing trap doing about 30mph with the crew sprinting up the ice to catch me before I started coming back down again. At the end of the day you come away with your official timesheet as a souvenir and one massive smile on your face.